We all want to catch hold the latest gadgets at first before someone else buys it to mark an everlasting impression on others. Apart from this we can also get some very attractive inaugural offers and have to pay relatively lesser during the initial few days. Amazon is the right place to search for the latest gadgets that are yet to launch in the market; this time it is Vivo NEX that will be made available at Amazon in a short span of time; however, you can pre-book it from 19th July, 1 PM onwards to avail the special exclusive launch offers on it. You can pre book Black Colored Vivo NEX in India for Rs.44, 990.00, against the original price of Rs. 47,990.00, a cash discount of Rs 3,000 (6%). This item will be released on July 27, 2018 and will reach to you at the earliest once available on stock. You can also get up to Rs 13,500 off if exchanging it with your older phones. You have to select the model and brand of your existing phone and Amazon will give you the best exchange price for your device. Aspect Ratio 19.3:9. The ultra slim bezels and COF screen encapsulation technology increases the bezel-less effect. Batteries 1 Lithium ion batteries are required which are included in the box. Apart from the mentioned pre book discount of Rs 3,000 on purchase of NEX, there are various other offers on this handset which will make your purchase much easier while shopping at Amazon, additional discounts can be availed using Amazon Coupons. • The customers who pre book their hand set can get additional Rs 5,000 off on exchanging it with their older mobile phones. • If you are using HDFC Bank debit/credit card, you can get flat Rs 4,000 off on all the debit and credit card transactions. • Also if you are a Jio customer, you can get attractive cash back worth Rs 1,950 along with free premium security subscription. • Get assured buy back of Rs 22, 495. Vivo Mobile India is operating a program called the ‘Buyback Guarantee offer’, which guarantees all the eligible customers 50 % value of the selling price of the original vivo NEX phone on the exchange of their original vivo NEX (“Smart phone”) bought from Amazon. For more please kindly visit the website. • The buyers can get one time free screen replacement of their product which is valid from 19th July 2018 to 31st July 2018. To get the benefit of this offer, the customers need to purchase Vivo Nex during the offer Period and activate the same by 15th August 2018. They can avail the offer by making a payment of Rs.990 (Labor Charge) anytime during a period of 6 months from the date of the activation of the product if the screen suffers external damage. • Also the customers can include Acko 1-year Screen Damage Protection Plan for Rs 1,499.00 and 1-Year Damage Protection at a discount of 19% for Rs 4,499.00 and will get free Amazon Voucher worth Rs 200 which can be used to shop any product from Amazon. 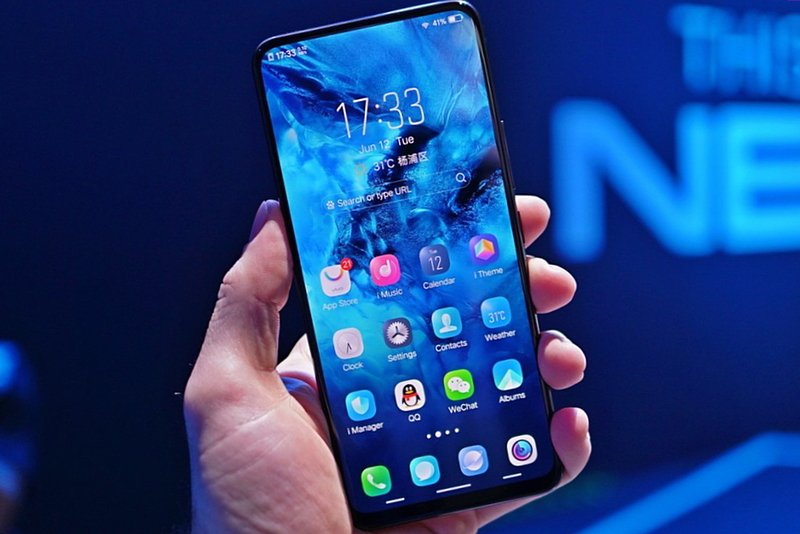 • The Vivo Nex comes along with screen protector (which will be pre-applied on your device), Solid Black Case, Type-C Cable, Earphone, User Manual, USB Power Adapter and SIM Ejector Pin. • Last but not the least; Vivo NEX is available with the gift wrapping option so that you can send it directly at the doorsteps of your loved ones as a gentle gesture of your love towards them. Following are the complete specifications of Vivo NEX so that the tentative customers can know about its benefits. Operating system Vivo Nex has the enhanced Android operating System Android v8.1 Oreo based system based on Funtouch OS 4.0 operating system. Also it features 2.8 GHz Qualcomm snapdragon 845 octa core processor with Adreno 630. Memory The device has 8 GB RAM, with internal memory of 128 GB internal memory. Also the dual slot tray can fit dual SIM (nano+nano) along with dual-standby (4G+4G) and memory cards. Overall performance This device has no comparison to other devices in terms of performance. Even in underground parking areas you can stay connected to 4G signals. For the gaming freaks, NEX has a cooling system that keeps the device cool while playing games. Display The smartphone has 16.74 centimeters (6.59”) full HD capacitive touchscreen with 2316 x 1080 pixels resolution. There are no visible holes on your screen for speakers as the screen itself is a speaker. Camera This smartphone has 5MP back camera and 12MP front camera that features AI Scene Recognition, AI Face Beauty, AI HDR, P3 Color Gamut. To experience the ultimate viewing experience, NEX’s front camera is hidden behind display that will be elevated in just a single second. You will experience the superb clicks irrespective of the surroundings. Warranty The customers purchasing the device will get a one year manufacturer warranty for device along with 6 months warranty for in-box accessories including batteries since the date of purchase. Battery The phone has strong battery life with 4000mAh battery power ratings and Dual-Engine Fast Charging technology. This device is tested for longer durability; you can connect it through Bluetooth, WiFi and Hotspot. These are the inaugural offers only that are available for limited time period and will not last long, so the customers who are thinking to buy it have be little proactive to grab these offers. Also if you are feeling bored with your older phones, it is the right time to exchange it with the newer ones. You will be paid the best exchange price for your older phone which you might not get at some nearby store; so rush to purchase the latest smartphone at the best offers and flaunt it among your friends and families.